Crocosmia is a genus of cormous Iris relatives (family Iridaceae) mostly from Africa. I grow what is known as the most cold hardy, Crocosmia 'Lucifer' (C. masoniorum × C. paniculata), originally bred in 1963 by Alan Bloom (Blooms of Bressingham, Norfolk, UK) in a batch of several hundred seedlings, later narrowed down and finally named in 1966 (the first named of six selections). The plants grow to about three feet tall, flowering at the start of July. The leaves are Iris-like, but pleated and a bit thinner. In warmer climates, like coastal climates, this selection (and others, I imagine) are terribly invasive and so should be avoided. Here they have not self-seeded, but to reproduce a bit asexually. The difference between the photos above and below was the use of the flash in the upper photo, a feature which can often have the effect of darkening the background giving the impression the photo was taken at night. While the photo above appears dark, the sun is out to at least 9:00 PM during the longest days of the year here. The most common visitors to 'Lucifer' were definitely hummingbirds, as you can see they work the plants from the early morning to the late afternoon into the evening. Other visitors were the large Western Tiger Swallowtail (Papilio rutulus) and, for some reason, a few wasps. In Africa, they are pollinated mainly by sunbirds (related to hummingbirds) who perch on the branched inflorescences and feed on the nectar. Past years have led me to believe this Allium was uninteresting to honeybees, but I now see I was either wrong (I just didn't see the proof) or this year they've decided they like it. No matter, it's the present that counts. Honeybees appear to forage strictly for the nectar, but a small amount of pollen seems to be collected by accident. These I grew from seed, this is the first year they've flowered, yay! The color is nice, they open white and fade to pink. Allium cernuum is an adaptable species, doing well in both sun and shade. My experience is that they do better with some summer moisture and not soil that isn't overly porous. The plants I have are a bit variable in height and bloom time, some already having formed seed pods while others are still in bud. It will be interesting to watch over time and see the differences. Bumblebees seem most attracted to these, even foraging on the individuals I have growing in pots in the shade, awaiting a final planting site. 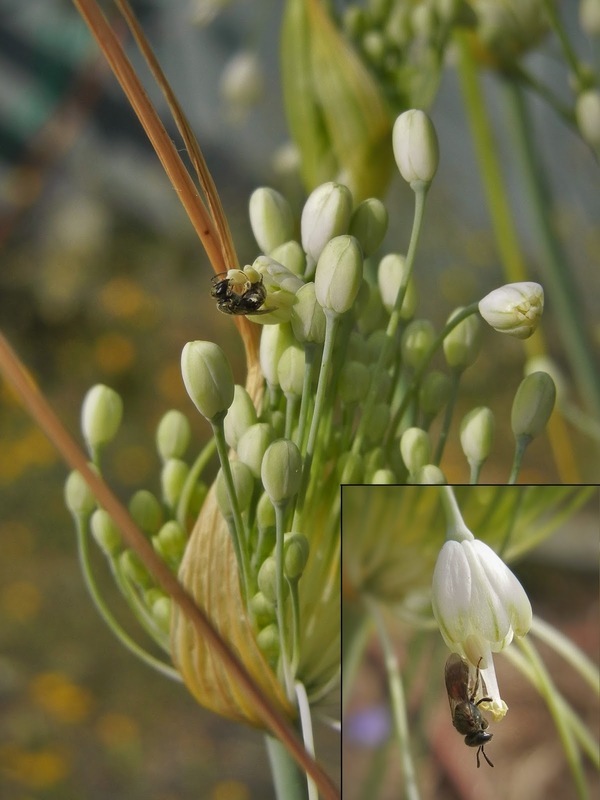 I have also seen tiny black bees, the same ones to visit the white Allium carinatum selection as seen here. The plants are in fact growing in close vicinity, except cernuum blooms a bit later. There is a chance that some accidental hybridization had been carried out, not an unwelcome occurrence to be honest. In the same bed as the above to Alliums is a nice compact mound of Calluna. Heather, not to be confused with closely related heath (Erica), is a European native, famed for the honey produced by honeybees who work the heathland where the plants are so abundant. The monotypic genus (having only a single species, or type = "mono-type") can be differentiated from the related genus Erica by a few characteristics. First, Calluna typically flowers in the warm part of the year, for me in Summer, while Erica flowers through Winter. Second, Calluna has scales for leaves, overlapping flattish small green scales, while Erica bears needle-like leaves that are mostly perpendicular to the stem that do not often touch. Likely due to the fact that I only have a single plant, honeybees are rarely seen working it, and I have never seen a honeybee touch it before this year. However this year I think the bees might be under stress, so they are working many plants that the have ignored in the past (including strawberry!) This year, honeybees are common on my heather plant, though I have yet to see more than one bee work it at a time. The wasps (Vespa?) have been the most common visitors to the heather over the years. Adult wasps feed on the nectar, but they do not collect it for their young. Instead they feed their young other insects, a protein rich food, similar to how bees feed their young pollen (also protein rich). Wasps are pollinators, though not considered as efficient due to the lack of the dense hairs as are found on most bees. I spotted this small weedy looking clover lookalike while at a river side park with my daughter. Honeybees, bumblebees, small solitary bees, butterflies, and a variety of flies were abundant in the area. Lotus is a genus that ranges from the beautiful, and possibly extinct in the wild, Lotus berthelotii (common in cultivation as an annual) to the somewhat weedy Lotus corniculatus. Being a member of the family Fabaceae (pea family), they are used to fix nitrogen in fields and also as a good anti-bloat feed for livestalk. The composites, named for the composition of tiny florets that make up the typical "daisy" are one of the first forms many children associate with what a "flower" is. The family, Asteraceae, is hugely variable in appearance and morphology, and has also attracted a wide range of pollinating insects. Many, like Calendula, Madia, and Matricaria (chamomile), have very shallow florets and so attract many flies and small bees who all have relatively short proboscises and mouth parts. Others, like Liatris and Veronia (do not confuse with Veronica, family Plantaginaceae), have long floral tubes where the nectar can only be reached by large bees and Lepidoptera (butterflies and moths). Some genera, like Artemisia, are believed to be wind pollinated, and are in fact insect deterrents. Echinacea has floral tubes that aren't particularly deep, but the protruding orange-tipped bracts exclude short-tongued insects from reaching the nectar or pollen. The large Western Tiger Swallowtail (Papilio rutulus) is the most prominent visitor, though as Summer has progressed I have seen less of them and more bees visit the flowers. Of the variety of bees, bumblebees and honeybees are the most abundant. I have seen a few honeybees work the flowers of my Echinaceas in the past, but this year I must have achieved critical mass because honeybees have been more abundant on the purple coneflowers than ever before. I have once read a study on how bees can attain minute quantities of active constituents from medicinally active plants that help with fighting infections and diseases (like thymol from Thymus, the active ingredient in most Varroa mite controls). I wonder if some of the immune system supporting constituents in Echinacea are passed into the nectar, and if they are useful to the health of bees (the same way Echinacea tea is good for humans)? Smaller butterflies, like this skipper, are also common visitors to the Echinacea. On a quick stroll around the garden one evening, I spotted a large hawk moth (Sphingidae) visiting the Echinaceas. I wasn't able to photograph it, it was dusk (too dark to get a good photograph at a distance) and far too fast for me to get close enough to it. This was special for me because it represents my very first observation of a hawk moth in my area. Hawk moths are large, similar in size to the large swallowtail butterflies, but as fast as hummingbirds. They are sometimes confused with hummingbirds because of the way they fly, and hover, able to fly backwards or any other direction to avoid predators. One of my favorite "weeds", chicory (Cichorium intybus) is a lettuce relative from Europe naturalized throughout the United States and elsewhere, probably introduced accidentally as an agricultural hitchhiker or escapee. The bitter leaves are used in salad, the roots roasted and ground to make a drink similar to coffee (or as a coffee additive), and the plants are used as a forage crop for livestalk. The leaves are rich in protein and other minerals, and the long taproot breaks through hardpan. Bees love the ephemeral flowers, borne early in the morning and withering quickly as the sun rises and the heat escalates (illustrated in the photos below, same plants, note the times). Honeybees occasionally work the flowers, as do a number of other bees. This small bee, similar to one seen on many other plants in my garden (Madia, Allium, Centaurea to name a few) spent a while on this compisite to make sure every floret was visited before flying away. The Eastern European spotted knapweed, Centaurea maculosa, is an invasive weed growing in roadside ditches and banks. It spreads aggressively by seed, and it is no wonder considering how appealing the purple flowers are to bees. I made the mistake of introducing it to my yard two years ago, only to pull it as soon as I learned of its ferocity. I have seen a few seedlings in the direct area since, which were promptly dealt with. I believe I have eradicated it from my garden, but more observation will be needed to be sure. While at the river with my daughter, the same place as the Lotus above, there is a large somewhat steep bank packed full of flowers, native and noxious, including this knapweed. Bees of all kinds, including the small solitary black bees seen elsewhere, were practically swarming on the plants. The plants are difficult to remove, very tough stemmed, and have deep tough taproots that regrow when pulled. Persistence is key to removing this species, and removing any flowers that develop is key to preventing seeds and the further spread. Yellow starthistle, Centaurea solstitialis, is second only to blackberry when it comes to my least favorite invasive weeds. Yellow starthistle is native to southern Europe and western Eurasia, likely introduced through agricultural means. The plants spread aggressively by seed, and are difficult to kill. They are the most difficult of Centaureas to remove, owing to the sharp spines, modified bracts, on the inflorescence. Like Centaurea maculosa, they will regrow from the tough taproot when pulled. Also like blackberry, however, they are very attractive to honeybees. In a square foot of space, it is not uncommon to see at least three bees feverishly working the spiny inflorescences. The honey from starthistle is said to be one of the best, mildly sweet, subtle flavor, and slow to crystallize. On occasion I go around the garden before work (I depart for work around 6:00 AM), because I know Ill find scenes like this. In an area less than a square meter I counted at least four of these male long horned bees, apparently sleeping (or too cold to move) on the opened Madia flowers. The males don't make nests, but instead wait in the flower patch for a female. This is common for solitary bees. The mint family is good as a rule for attracting bees. The plants are often easy to please, and flower over a long period. Some are very drought tolerant, and they are usually safe from browsing deer who dislike the minty flavor of the leaves of some species (though not all "mints" have the characteristic mint smell or taste). True mint, genus Mentha, should generally be avoided in the open garden and left in pots. Otherwise they are sure to spread like mad and become a huge problem, smothering out other plants. Bees will occasionally work mint flowers, but there are other less invasive species that also attract bees and other pollinators. Like many in the mint family, oregano is generous with nectar but skimpy on pollen. This is one strategy when the plant uses it's energy to produce many nectar rich flowers with little pollen. The small flower size helps ensure that the minuscule amount of pollen is transferred to the bee (or whatever), who then visits countless other flowers, increasing the chance of fertilization to take place. This is opposite the case with genera like Tulipa or Lilium which produce few flowers in comparison and a large quantity of pollen. Nepeta (catnip) is something I planted around my garden from seed sown in situ about four years ago. They have attained great size, reaching four feet in height and width, covered in tiny florets. Honeybees and bumblebees work the flowers from dawn til dusk. Deer obviously do not bother them, too minty (but not invasive). Another plus, I almost never need to water them. Even with the drought, weeks in the 100 F degree range, the plants continue to thrive, produce nectar, and attract bees en masse. I highly recommend this to anyone who wants to attract bees to their yard. Another well behaved member of the mint family, Agastache foeniculum (AKA anise hyssop, do not confuse with true hyssop, Hyssopus sp.) was grown easily from seed a few years ago. The plants have mint-like leaves that taste like licorice, edible flower spikes of the same flavor, and tough upright branched stems that hold the plants steadfast through inclement weather. The densely packed flowers are highly attractive to bees. Bumblebees are often found very early in the morning, well before honeybees emerge from their hives. Honeybees are soon to follow once the day warms. The plants are tolerant of dryish soil, but will do best in a somewhat irrigated situation in full sun. Where there is shade or if they are too crowded, they will grow tall and gangly, not the best situation for them. Once again we see this tiny black bee, an apparently common solitary bee here where we live. Perhaps someone has experience identifying bees and is willing to shed some light on this bees identity? Another Agastache, the variable nettleleaf giant hyssop, grows large and happy alongside the river in association with Centaurea maculosa, Lotus corniculatus, and Melilotus albus (not pictured, but it was visited by a variety of pollinators in the area) among others. This species is native inland from Eastern Washington into Canada, south to coastal Southern Oregon and into Northern California, and East into Colorado. It is large and very floriferous, no doubt a very important pollinator plant wherever it resides. All types of insect pollinators were visiting the countless flower spikes. The florets are very plentiful in nectar, shallow enough for flies and beetles yet enticing enough for bees and butterflies. Though I did not see any, I would wager that hummingbirds also visit the flowers in the mornings or evenings before there is too much human activity. Siskiyou monardella grows in both full sun and shade, more prostrate in the latter. The plants are attractive and well behaved members of the mint family, coexisting well with other garden plants (even more aggressive neighbors). This genus, as well as the closely related Monarda, represent a different form of inflorescence when compared to the "spiked" inflorescences of the above genera. Instead of a spike, the florets are arranged on a ball that does not elongate or extend, but blooms from the inside first, much to the opposition of the florets of members of the Asteraceae (Echinacea, Helianthus) which bloom from the outside in. While bumblebees are the most frequent patrons of the tiny purple tubular florets, beetles and other pollinators are also attracted. I planted this a few years ago, both for the name (bee balm) and for the leaves which when rubbed onto the skin are supposed to keep mosquitoes away. I haven't been able to substantiate the latter claim, I think the leaves just act like a marinade to make me taste better to the blood suckers, because I still get gnawed more than a dog's favorite chew toy by the little disease spreaders. Nonetheless, I planted it in the border surrounding my vegetable garden where it mingles happily with the catnip. I grow it in full sun with a drip hose. While it is said to tolerate drought, I think it does best with irrigation. The bee balm (interesting name, the flower tubes are far too long for any bee to reach the nectar properly) have in fact received a lot of attention from bumblebees and honeybees. They steal the nectar by biting a hole at the base of each floret. Hummingbirds do it right, and I've seen them from time to time visiting this plant. The one bee I have seen most often is the giant Xylocopa sp., a large and loud species of solitary carpenter bee. The bee is the largest in the region, larger than bumblebee queens, and probably has a longer proboscis. Much of the time, I observe the bee foraging at the flower entrance, other times it bites a hole at the side. Another excellent read Travis. Wonderful observations which, since you started your Blog, have had me, I must admit, looking a little closer at the interactions in our own garden ! Hope you can find the time to keep this going. Thanks Ron, I'm happy it has that affect! Often when focusing on "the environment" we tend to look at things on a large scale (i.e. the Amazon). I think it is valuable to look at the small scale. Living in Oregon, lumber being our biggest export, I often see clear-cuts and think to myself, "What has been lost?" After seeing how much diversity can fill a small area, it's hard not to wonder.